097.Volkslesen.tv – JavaMuseum 2010 – Celebrate! 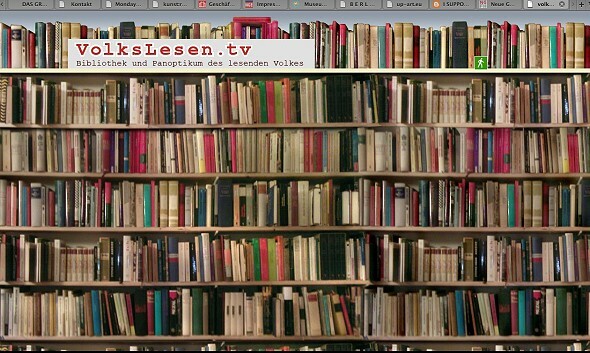 VolksLesen.tv is internet television for people who love books. 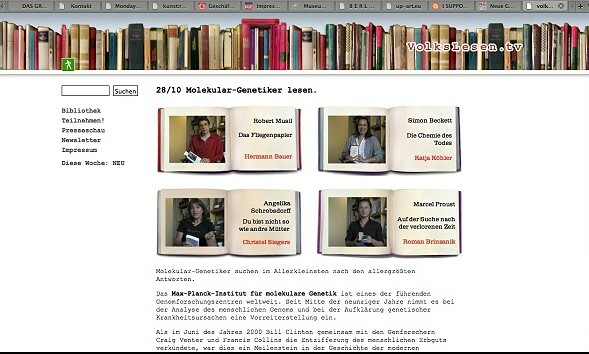 VolksLesen.tv is internet television for people who love books. Our program looks that: People read out before the camera a short cutting from a book that is important to them. The readings last about 5 minutes. Sometimes shorter, sometimes longer. We show every week four new readings. Every week reads a group of people. Up to now philologists and homeless, taxi drivers and member of Bundestag, midwives and fire-fighters, allotment holders and Jesuits, blind people and clairvoyants have read. VolksLesen is not about the perfect reading, but the people who read. The program runs since January, 2008. Meanwhile more than 500 people have read. You can find all readings on the website in the library. VolksLesen is about people and books, it´s also a picture of our time and society and a mirror of our cultural identity. If VolksLesen would exist for 30 years you could look back into the 80s. In 2040 hopefully it will be possible to look back in our times on VolksLesen.